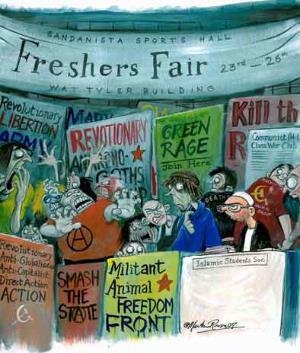 Universities hotbeds of Islamic radicalism? The government’s reaction to new security threats, in particular an increasing surveillance of Muslim students, is a public-relations exercise to satisfy popular demands for tough action. The portrayal of a disproportionate threat from the Islamic community does not reflect informed opinion about how most young British Muslims – and university students in particular – live their lives. In this respect, it could well be counter-productive, alienating a law-abiding part of the British population. That Cambridge should issue a press release as grandiose as this, trumpeting research so flimsy and uncompelling as Edmunds’s, is curious.This research was based on only 26 interviews (of which eight were not even conducted in person). Hardly “detailed”. Prof. Anthony Glees proceeds to list the methodological reasons for which Edmunds’ research should be considered ‘weak’, and among the ‘sins’ listed we can read: not quoting Prof. Martin Innes’ study, which however, focused on the disaffection of young Muslims with the British police and politics, and was commissioned by the Association of Chief Police Officers (Acpo); not using media reports of terror arrests, trials or convictions, and, the most capital of all sins, not basing her research upon any polling evidence, such as that conducted by YouGov on behalf of the right-wing think-tank, the Centre for Social Cohesion. We can read the short Cambridge based research as a trend indicator instead of the ‘final answer’ to an issue, which, as we shall see, is more complex than we can expect. Yet Prof. Glees’ criticism of Dr Edmunds’ research tells us more about his idea of research than the possible weaknesses of the Cambridge ESRC project. Prof. Glees has also an endemic allergy to any independent research (as to the state university system in general), since, as he has suggested in his criticism of Dr Edmunds’ research, what really matters is media reports of terror arrests, trials or convictions and even dubious polls conducted under the control of partisan organizations such as the Centre for Social Cohesion. Serious scientific research, based upon strong methodology, ethical guidelines and peer-reviews are, fro Prof. Glees, just obstacles to the ‘right’ way of ‘fighting’ extremism. Indeed, Prof. Glees among others in certain ‘charities’ known as think-tanks are not engaging in scientific research but rather taking advantage (including economic advantage) of the infrastructures which the ‘war on terror’ have provided. While, together with others, Prof. Glees provides the mass media with the alarmist food they need for their news and inspires the government to suggest certain types of policy making (sometimes extremely disturbing in order to maintain enough attention). He, like others in the same field, cannot explain why, in which way, or for what reason we have a phenomenon called ‘extremism’. In conclusion, although Dr Elmunds’ research should be understood as a pilot research for further and more in-depth research, Prof. Glees’ criticism were surely short of academic strength. Leaving aside the Glees vs. Edmunds polemic, we may wish to ask a more serious question which targets the center of the University and extremism issue. Is all this debate about universities beings hotbeds of Islamic radicalism just a waste of energy, effort, money and resources? Are we engaging in a futile ‘exercise’ called ‘spot the radical in the gown’? Let us observe some simple points. First of all, we cannot discuss extremism, fundamentalism, or radicalism without defining it. Depending upon how we define it, we may then can classify whom, or which group, is the extremist. Of course, there are many definitions available and they are highly debatable – so the debate soon becomes endless and unproductive. It is thus better to move from this view and just ask: are there serious criminal activities taking place in universities? Surely, through my experience, the most serious crimes on campus tend to involve drugs. However, such widespread problem does not attract much in the way of attention. Indeed, your child, today at any university, is more at risk of becomming a drug addict or alcoholic than a political or religious extremist – yet where is the publicity surrounding this danger? Secondly, why are we discussing whether universities are places where extreme ideas are developed? They are and they have always been. The most extremist political movements have grown up within universities – to name only one, The Red Brigades and their most important ideologue, Renato Curcio. Universities are places in which ideas, some positive and others negative, are debated, formed, deconstructed and redeveloped. To try to control this process is a futile effort. So, the question is not whether ‘extreme Islamic ideas’ (or fascist, racist, anti-gay, Christian fundamentalist, and so on) are discussed, offered, or developed in certain university environments but whether they attract a majority of students, in this case Muslims. No study can claim that the majority of Muslim students in British (or any other to the best of my knowledge) universities are attracted to, or even come into contact with, such ideologies. Indeed as I have suggested in my last book, radicalism and extremism have more complex dynamics than simple indoctrination. Thirdly, it is true – fully true – that there is frustration among Muslims in the UK about the government, the mistakes made, the reluctancy to admit those mistakes and the singling out of an entire community. This is a reality which affects an entire community and not just students. The issue is called ‘dystopia’. Certainly insisting that radicals and extremists are winning the hearts and minds of a majority of Muslims (something fully untrue at this time but possible in the future) does not help to address the causes at the root of extreme ideas, not just among Muslims but among human beings in general. Hence, focusing on universities, and singling out a specific environment as the ‘alma mater’ of potential religious violence, and engaging in long diatribes on whether extremism is there or not, does not provide any real or useful answer. Yet there are people with extreme ideas, and not only “Islamic”, in universities as there are in any other environment of where many different kinds of people come together. In reality, some of my research tends to suggest that the strongest extreme ideas, including religious and “Islamic”, can be found not in universities but rather in high schools. Yet we have also to take into consideration the age of the students: how many of us have been ‘extreme’ in our way of thinking at the age of fifteen? ← Rohingya Muslims and injustice: a security issue? Despite involvement in materialistic life a large section of the world society is in search of the truth; the truth about their life, purpose, God, creation of the universe and means of peaceful existence on this planet. Any philanthropist organization, even if religious, should aim to guide the humankind to truth without any bias. The truth may be from any religion, the true philanthropist organization should make efforts that truth reaches the people; especially those who are in search of the truth. There are several claimants who claim that they have the knowledge of truth but none of the claims can satisfy the test of scientific verification, rationality and sensibility of the human sense perceptions. The book “Natural World Order & The Islamic Thought” is basically a book of philosophy and contains the theory of phenomenon of life, theory of cosmology and the alternative political system which could be applicable & practicable and through which peaceful existence of humankind on this planet is possible. This book, in purpose, has been written in a style so that all readers could understand it; but only the philosophers could understand the deeper philosophical concepts which have been advanced through this work. The work is the final philosophy as on date concerning political philosophy, metaphysics, creation of life and cosmos. The true philanthropist organizations, without any religious bias, should make all possible efforts to propagate the message contained in the book in the interest of the humanity. A very interesting discussion. Not being a specialist in this area, I was wondering, Gabriele, if you could say a bit more about that generational clash among Muslims in the UK – or indeed in other countries. Also you mention the roots of Islamist extremism – what are they? I understand that an Islamic ‘reflowering’ or da’wah has been in the making for decades around the globe. This seems to intersect with the life courses of a statistically small number of young Muslim men who feel compelled to ‘do something’ about what they perceive to be a Western-Israeli conspiracy against all Muslims. The recent book by Ron Eyerman about the death of Theo Van Gogh fits in with this account. The killer was a young Dutch-Moroccan male caught between Dutch and Moroccan worldviews and social fields who had to do something about Van Gogh’s breach. Eyerman uses the theory social drama to interpret the killer’s public performance. I would be interested in seeing a study done here in Sydney/Australia in general to see how this dynamic compares to the UK or USA due to the (Muslim) population differential and also the different political climate. When I converted in ’91, the (redbrick) IslamSoc was dominated by ‘Wahhabis’ feasting on cheap ?Saudi-funded literature. But their engagement with Wahhabism was largely adolescent – it was as much about what you wore, and their resentments were largely fueled by their own experiences of good ol’ fashioned British racism. I strongly suspect most, if not all, of the two dozen rebels who circulated round our IslamSoc are now grown up, employed, boring, and of varying Muslim perspectives. The most henious crime they ever committed was talking utter shite and none, to my knowledge, became terrorists. Yes, in many cases this is exactly the situation. I agree with you. Indeed, I think that some of the most boasting radical rants I have heard were just words and can be compared to the classic ‘youth rebellion’ that is typical of a certain age. However, we should not underestimate the level of frustration, isolation and dystopia which has affected the Muslim communities (not only in the UK) in the last 20 years, particularly among the younger generations. This dystopia is not only linked to the political issues affecting the UK and ‘good old fashioned British racism’, but also the Muslim community in itself, its leadership in mosques that cannot represent the young generations and a serious generation gap. It is this internal, more than eternal, disenfranchisement which is potentially dangerous.